A Fridge with a built in Keurig!!!! General Electric Co. will launch a new refrigerator that brews a single cup of coffee and dispenses steaming water for instant soups and oatmeal starting this fall. During a briefing Wednesday morning at Appliance Park in Louisville, the company unveiled a prototype of what executives described as an “industry-first” appliance retailing at about $3,300, which they intend to produce under a partnership with Keurig Green Mountain Inc. The Vermont-based manufacturer makes popular countertop single-cup brewing system and disposable cups with a variety of coffee, tea and hot chocolate brands. No new jobs are expected to spring from the development, but the company has added a line in its refrigeration facility and projects strong sales. GE declined to disclose planned production targets. 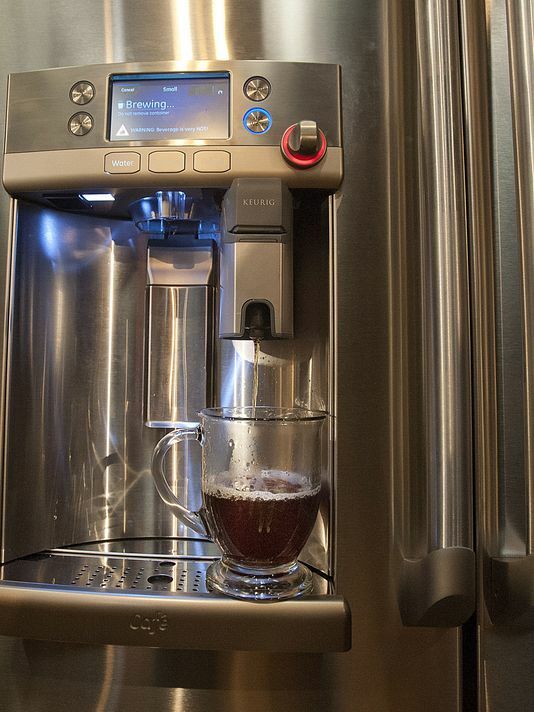 The so-called GE Cafe’ Series refrigerator with Keurig K-Kup Brewing System comes a week after the company unveiled a new line of app-connected appliances for the kitchen and laundry room that allow consumers to remotely pre-heat the oven or check the ice in the icemaker. This is the time for such rollouts because appliance makers exhibit new wares for building contractors, industry analysts and media tracking smart-home innovations at annual trade shows. While the GE and Keurig pairing is truly new, dispensing drinks from the fridge isn’t. Whirlpool launched a refrigerator seven years ago that’s available overseas with a built-in espresso maker. Local officials cited a National Coffee Association survey of drinking trends showing that 29 percent of respondents who drink coffee said they used a single-cup brewer in 2014, a jump of nearly 50 percent from the previous year. “There’s no denying the single-serve brewing trend is piping-hot,” the companies’ officials gushed in a joint news release. The refrigerator looks like a standard French-door, bottom-freezer model, with a filtered-water dispenser on the left door. But there are more features. Owners plug a capsule of coffee or tea into a plastic holder, which slides into the door dispenser and with the press of a button, the coffee drinker heats filtered water to start the brewing process. Because the system is “connected,” owners with Wi-Fi can preset the brew time via their mobile device so the water inside an interior reservoir is heated and ready to dispense. For safety reasons, hot water can’t be dispensed remotely, lead engineer Nick Gilkey said. After twisting a dial on the door panel, the java or hot chocolate brews as the hot water flows through the disposable K-cup and into mug. The process is completed in about four minutes. Win $10,000 in our Dream Kitchen Makeover Sweepstakes!